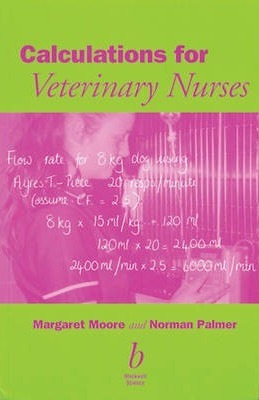 New book, 168 pages.This handy pocket book will help veterinary nurses with all types of calculations. Numerous worked examples are included to develop the reader's confidence in carrying out the procedures involved. Each type of calculation has its own separate section in the book and the authors have used the simplest possible method in explaining each one. The book is structured in such a way that the reader can progress from a simple explanation of the arithmetic principles involved, to the application of these principles to essential veterinary calculations. Qualified veterinary nurses and students alike will fine this book an invaluable reference source, whether performing relevant veterinary calculations or studying for professional examinations. Key features are: convenient size; ideal as a self-teaching manual; and, accessible and user-friendly style. It includes worked examples, self-test exercises and answers where appropriate.